Valentine’s day. Everyone rages against it when they’re single, waits with bated breath for it when they’re dating, and when they’re married… what are the expectations? I guess I don’t have many. On my way home from work, I stopped at the local florist shop. The man behind the counter gave me an odd look, checked my left hand, and then asked what I wanted. I figured it was the least that I could do. It was nearly 6 o’clock already, I had no plans for what I would cook for dinner (which the hubby often takes care of anyway), and it had been a long stressful day of work. So with my rose in hand, feet sore, eyes tired, and probably looking a bit worse for the wear, I walked into my house. And was greeted by the smell of something cooking in the oven and a husband who gives the most amazing, comforting hugs in the world. 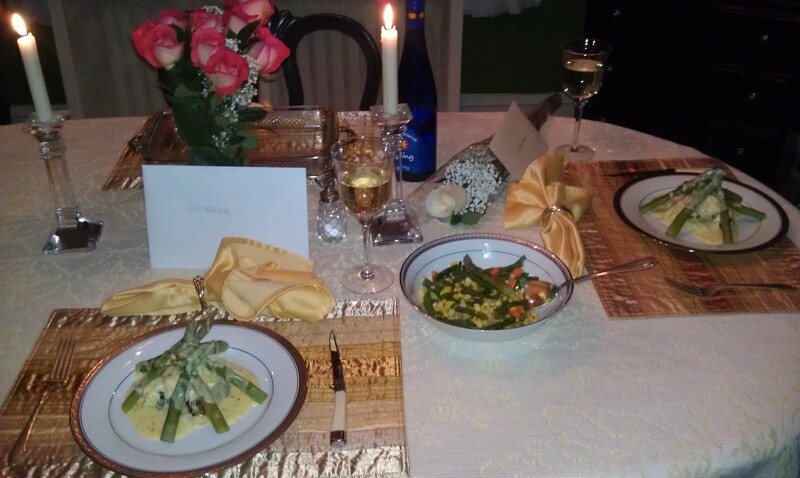 Asparagus Steak Oscar, my favorite white wine, roses, and a card. Who couldn’t love that? He surprised me. He’s getting very good at that. I told him if he made this more often I would give up carbs for life. Gladly. But all joking aside. I am amazed, overwhelmed, and constantly surprised. Maybe it’s because the house is still so new to us. I still sometimes walk through the house, picking up and cleaning, and wonder how this all happened, how this is ours. Maybe it’s because we’ve only been married for a year and a half – it is still “new”. But with every experience and every first holiday in the house, every time we have friends over for dinner, I get the same feeling. This is ours. This is the life we have made. This is the amazing gift we have. Happy Valentine’s Day to my husband who makes this life so special and reminds me how surprising and amazing simple things can be.